LAS VEGAS -- As an outfielder, Harold Baines was the first overall pick in the 1977 Draft. As a starting pitcher, Lee Smith was a struggling Minor Leaguer. They're headed to Cooperstown as a designated hitter and reliever respectively. 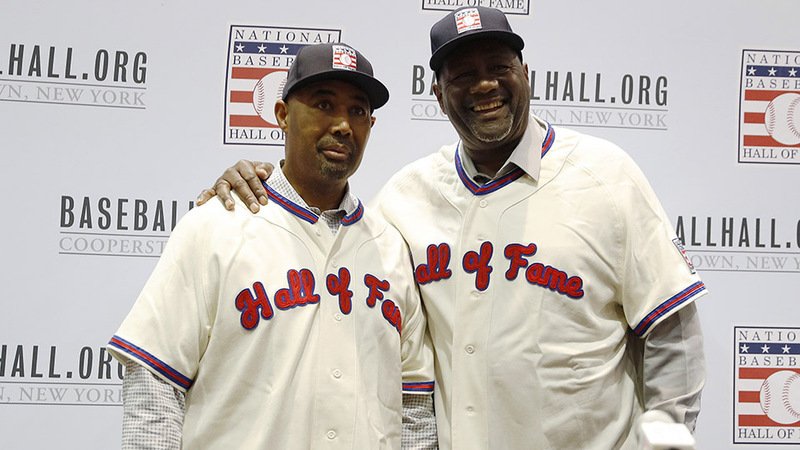 Baines and Smith were introduced Monday as the first two members of the Hall of Fame Class of 2019 during Monday's news conference during the Winter Meetings at Mandalay Bay Resort and Casino. As announced Sunday, the pair were elected by the 16-member Today's Game Era Committee with Smith receiving votes from all 16 while Baines got 12, the minimum required for election. The initial announcement came as somewhat of a shock across the baseball world, given the way both players could be viewed by modern standards. Baines finished with a collective 38.7 WAR, according to Baseball-Reference, while Smith retired with a 29.4 in that category. But it was the way in which both embraced their specialized roles, leading to lengthy careers, that helped punch their tickets to Cooperstown. Smith was selected by the Cubs in the second round (28th overall) out of Louisiana in 1975, but didn't look the part of a major prospect during his early professional years, at least when it came to being a starter. He repeated Class A Pompano Beach in 1976 and 1977 and did the same with Double-A Midland in 1978 and 1979. In 1978 -- his last professional season in which he made 25 starts or more -- he posted a 5.98 ERA, fourth-highest among Texas League pitchers with at least 100 innings, while leading the circuit with 128 walks in 155 innings. At the time, failed Double-A starters weren't exactly expected to impact Major League rosters, never mind putting together Hall of Fame careers. When Smith was struggling in the Texas League, the career saves leader was Hoyt Wilhelm with 228. Since then, 40 other Major League relievers have passed the mark, Smith included. It was enough to make Smith want to walk away ... until he heard from another Hall of Famer. "Back in the day when I was starting my dreams of Major League Baseball with starting pitchers like the Bob Gibson and Fergie Jenkins and Nolan Ryan, you wanted to be a starting pitcher, because in that era, it was somewhat a slap in the face being a relief pitcher," Smith said Monday. "Usually the starter went a complete game, or if he didn't, he got knocked around and it was like a mop-up crew. Luckily, Mr. Billy Williams came to my home and talked to me. I asked him about quitting baseball. ... [He] talked to me about playing. We're on the air so I can't say exactly what he said to me, but he said, 'Hey, you haven't done anything in this game yet. Go out there and earn your place.' The rest is history, and I love him for it." Smith took on a full-time relief role with Midland during his second go-around with the club in 1979 and was in the Major Leagues a year later. The right-hander ended up playing 18 years in the bigs, eight with the Cubs. He retired following the 1997 season with 478 saves, most in history at the time. He's since been passed by Mariano Rivera (652) and Trevor Hoffman (601). The latter was elected to the Hall last year and the former is expected to join Smith on the induction stage next July. Baines had a more accelerated route through the Minors ranks -- no surprise given his Draft status in 1977, when he was taken first overall, two spots ahead of now-fellow Hall of Famer Paul Molitor. Baines played for three White Sox affiliates, one apiece from 1977-79: Class A Appleton (1977), Double-A Knoxville (1978) and Triple-A Iowa (1979). His best season in the Minors came during his final stop in the American Association, where he hit .298/.342/.528 over 125 games. His 22 homers were a then-career high and tied for fifth-most on the Triple-A circuit that year. The White Sox rewarded their obviously Major League-ready prospect by making him the Opening Day right fielder in 1980. He primarily became a designated hitter in 1987 after knee injuries took their toll, a move that the sweet-swinging left-handed slugger said likely lengthened his career. He finished with 1,565 starts at designated hitter and 1,014 in the outfield. "I was fortunate the American League still had the DH and I could still hit a little bit," Baines said. "I had a manager that believed in me in Tony La Russa." La Russa might have played a pivotal role once again in Baines' baseball legacy. The former skipper was one of the 16 members on the Today's Game Era Committee, along with White Sox owner Jerry Reinsdorf and former executive Pat Gillick, who signed Baines to the Orioles in December 1997. Baines ended up playing 22 years in the Majors with five different clubs, finishing with 2,866 hits, 384 home runs and six All-Star appearances. He never received more than 6.1 percent of the vote from the BBWAA during his five years on the regular Hall of Fame ballot and dropped off completely after getting 4.8 percent in 2011. Without defensive value, designated hitters require even gaudier offensive numbers to crack the Hall. Edgar Martinez's continued absence from the Hall after nine years on the ballot speaks to this. Baines may have needed 3,000 hits to make his case iron-clad, but fell just short. Even he's not sure whether that would have been enough, though it doesn't matter following this week's news. "I don't know," he said. "Every time I heard [about 3,000 hits], they said they don't recognize the DH, so it might have still been hard. I'm very thankful to the Committee." The thought of being left out of Cooperstown, however, never fazed the slugger, who sits 20th all-time with 2,830 games played. "I think that's the way I was raised," Baines said. "You go do the job. You're there for your teammates, for your coaches. You're not there for the accolades. If that comes later, fine. But you're there to be a team." Beyond Monday's stage, Smith believes he shared a few similarities with Baines. Yes, they were both asked to do less for their clubs in their respective roles, but for those clubs, what they did was enough. More than enough, even. And now, it's enough for the Hall of Fame too. "I think Harold and I fall in the same boat, for the fact talking about the designated hitter as it is to the closer," Smith said. "They're singing the same song of 'The guy only pitched one inning' or 'The guy only had so many hits.' But I'll tell you what, those guys right there are the mainstays of a ballclub. Being in the middle of that lineup, that's a tough thing. I think we both were sort of slighted in the sense looking at a closer throwing one inning or the designated hitter being just a hitter. But those guys have tough jobs to do."